In the world of construction, some parts and products are color-coded for convenience. 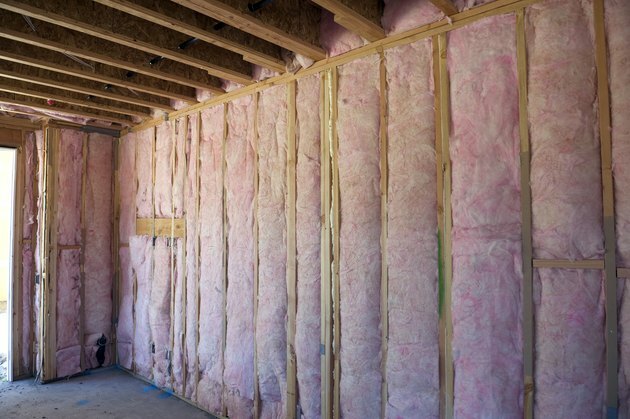 After seeing a few different colors of insulation on the market, you might think the yellow, pink, white, green and brown colors carry some significance. In reality, the color of insulation typically has nothing to do with the type of material it is made out of. Instead, the color usually represents the color of the binding agent used by the manufacturer. Fiberglass is undoubtedly the most popular choice of material for home insulation. However, according to the U.S. Department of Energy, other choices include mineral wool, cellulose and other natural fibers, polystyrene and various foam materials. Different materials appeal to builders and homeowners due to characteristics, such as fire resistance, insect resistance, insulation performance, longevity and cost. Fiberglass naturally appears clear. Insulation manufacturers bind the microscopic strands of fiberglass by using a resin. The color of this resin determines the final color of the insulation. The same holds true for other insulation materials, such as polystyrene. But other materials may appear in their natural state. For example, cellulose fiber insulation, also known as newspaper insulation, tends to look brown or white. Two primary types of insulation installation techniques exist. The first is known as batt and roll and the second is called blown-in or loose fill insulation. The color of the insulation does not determine the type of installation procedure that will be used. White insulation, for example, can be installed as either a batt or loose fill. The insulation material is the determining factor for how it will be installed. Fiberglass, rock wool and cellulose fiber insulation are the most common materials used in blown-in projects. This installation technique keeps the insulation materials loose and crumbly, allowing air pockets to naturally form between the fibers. A blower machine allows the installer to place the materials precisely where they need to be. Construction teams typically reserve this type of installation process for attic floors, because the materials can lay horizontally and will not be compressed by any paneling. The materials used for loose fill projects can also be bound together in rolls or batts, which form a solid but soft and malleable carpet-like shape that can be easily cut to size. These are typically placed in the spaces between wall joints. Due to the rigid nature of polystyrene and foam-based products, these insulation materials are commonly sold in flat panels and are cut to size.